What does Bankim mean, details, origin, short & easy attributes? Bankim pronunciation in 20 different native languages. Name Bankim generally means Curved or Not Straight or Crooked or Half, is of Sanskrit, Indian origin, Name Bankim is a Masculine (or Boy) name. Person with name Bankim are mainly Hindu by religion. Name Bankim belongs to rashi Vrushabh (Taurus) with dominant planet Venus (Shukra) . Bankim is baby boy name mainly popular in Hindu religion and its main origin is Hindi. Bankim name meanings is Curved, Lord Krishna. Bankim is written in Hindi as बनकीम . Other similar sounding names can be Bankimchandra. Each letter meanings in Bankim Name. Popular personalities with Bankim Name. 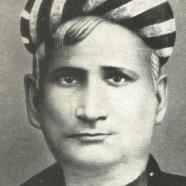 Bankim Chandra Chattopadhyay was a writer. Bankim was born on June 27th, 1838 in Naihati, Bengal, India. He died on April 8th, 1894.